Jessica Mindell, founder of Jessica's Natural Foods, used to hand-deliver her gluten-free granola. Now it's sold in Whole Foods and other grocery chains. 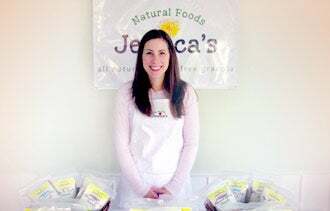 In May 2009, Jessica Mindell was all set to bake the first batch of gluten-free granola she would sell under the label of her new business, Jessica's Natural Foods. She borrowed her father-in-law's SUV and drove all the way from Birmingham, Mich. to Chicago, where two contracted bakers were waiting for her. Mindell spent Memorial Day weekend making hundreds of pounds of granola. Then she packaged the finished product in 900 bags, loaded them into the SUV and drove back to Birmingham, where she started cold-calling local grocery stores and filling orders. "That's how I did things for a long time early on," says Mindell, whose husband's gluten sensitivity inspired her granola creations. "I would go store-to-store and hand-deliver the granola." Today, Jessica's Natural Foods is a success story of the gluten-free retail market, which is currently worth an estimated $4.5 billion worldwide. Her granola is stocked in Whole Foods in the Midwest as well as a number of Michigan stores and chain groceries. Her projected sales for 2012 are $550,000, up $100,000 from last year. Sales of gluten-free food and beverages, once decidedly niche products, grew 30% year over year in the United States from 2006 to 2010, according to market research firm Packaged Facts. The firm projects U.S. sales alone will reach $5.6 billion by 2015. For an increasing number of business owners, this growing market presents an unmissable opportunity. Take entrepreneur Scott Adams of the Gluten-Free Mall. A celiac sufferer, he created the first informational website dedicated to the disease in 1995, and launched the first e-commerce site for gluten-free products three years later. It was "a market that wasn't being tapped at that time," Adams says. Gluten-free diets have traditionally been the preserve of people with celiac disease, an autoimmune disorder that causes intestinal damage when gluten, a component in the cereal grains wheat, rye and barley, is eaten. Medical experts estimate that one in 133 Americans, or more than two million people, have celiac disease, although only about 200,000 have been diagnosed so far. However, awareness of the condition is "increasing tremendously," says Lola O'Rourke, a dietician at the non-profit Gluten Intolerance Group. An additional 18 million people suffer from non-celiac gluten sensitivity and would also benefit from a gluten-free diet, according to Susie Flaherty, spokeswoman for the University of Maryland Center for Celiac Research. "If you're talking about growth markets, I'd say it's pretty exponential," she says. Beyond medical reasons, gluten-free diets have become a lifestyle choice, popularized by professional athletes like Green Pay Packers running back James Starks and celebrities like Kim Kardashian. "Forget about the South Beach Diet. Now it is the gluten-free diet that is fashionable," says Dr. Alessio Fasano, founder and director of the Center for Celiac Research. A gluten-free diet offers no health benefit to average people, Dr. Fasano says, but it might give athletes at the highest levels of sport an improvement in performance. While high-profile dieters have raised awareness of the gluten-free lifestyle, Darin Alpert, the chief operating officer of mobile app Find Me Gluten Free, has based his business on the outsize social influence of celiacs and others with medically restricted diets. "Gluten-free consumers typically dictate where their [group is] going to eat. They have veto power," Alpert says. "So when someone is searching on our app, it really is a pretty powerful market to get to, especially for advertisers. You're not just getting the gluten-free customers, you're getting their friends and families." Find Me Gluten Free is essentially a search tool for gluten-free restaurants, bakeries and other businesses in your area, complete with ratings, reviews, contact information and directions. It works nationwide and, with over 125,000 downloads, is first among gluten-free apps in both the iTunes store and Google Play, the Android app market. In April, billionaire entrepreneur Mark Cuban invested in Find Me Gluten Free, making it possible for Alpert and his partner, Jason Elmore, who suffers from celiac disease, to make growing the app their full-time job. The app is already profitable, Alpert says, thanks to featured advertising from gluten-free businesses and Groupon-style deals on both the national and the local level. Every day, users suggest new shops and restaurants they would like to see added to the app's search results. As the market continues to grow, large brands are entering the fray. In 2011, General Mills launched GlutenFreely, an information and e-commerce site competing directly with the Gluten-Free Mall. Says Adams, who owns the website Celiac.com, "I've seen it go from the extreme of almost no competition, where I could buy almost any domain name I wanted, to what it is now, which is extreme competition, where the players now getting into it are huge." Dr. Fasano is even fielding calls from venture capitalists wanting to know whether they should invest in the gluten-free market. He predicts long-term stability. The number of people who fall away when gluten-free is no longer fashionable, he says, "will be counterbalanced by the number of people with celiac disease who are going to be diagnosed."